Globalization may be a modern buzz word, but it is reality in Hamburg for more than 100 years. The city built a whole warehouse district in the late 19th century for precious goods from around the world: the historic Speicherstadt (literally: warehouse city). 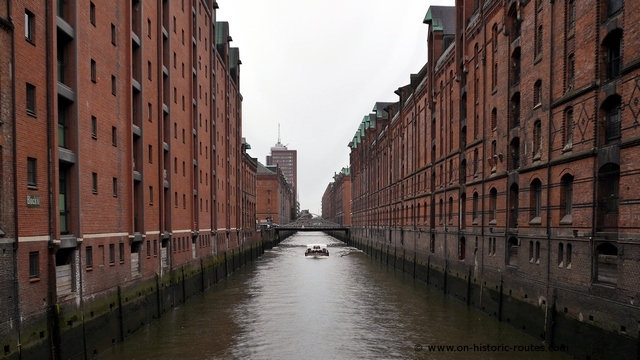 If you’re in Hamburg, make sure the historic Speicherstadt is on your list. It was added to the UNESCO World Heritage list in 2015 as an example for the international trade in the 19th and early 20th century. It is within walking distance from the city center or the riverfront at the Landungsbrücken. When you are doing a harbor cruise, you can easily include the Speicherstadt. It gives you a different perspective of the warehouse complex. There are several options for harbor tours, they leave from the Landungsbrücken riverfront. You should also take the time to walk around the warehouse district, though. 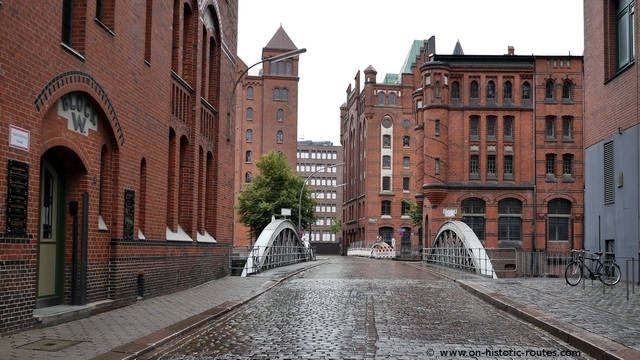 The brick architecture is impressive and there are nice views between the bridges, canals and cobblestone streets. 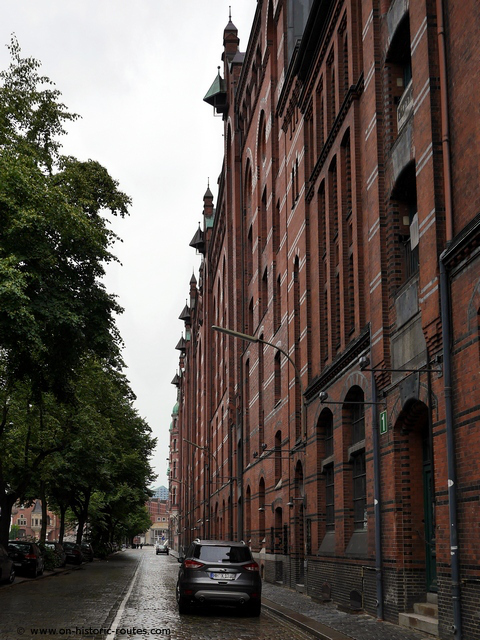 The Speicherstadt was built from 1883 as a free port are, while the rest of Hamburg was incorporated into the newly found German Empire. Two former neighborhoods were removed to built the huge warehouses on small islands in the Elbe river. Even today they rest on oak logs driven into the ground. The warehouses were designed to have a water entrance for barges on one side and a land entrance for wagons and trains on the other. The lowest floor was not used for storage as it was not flood-proof. The remaining five floor could be accessed with winches on either side of the buildings. About half the buildings were destroyed in the World War II air raids on Hamburg and not all of the old buildings have been restored. Outside the core area, there are more modern buildings. Since 2004, the area is no longer a free port and urban development changes the former harbor neighborhood into a inner city area. 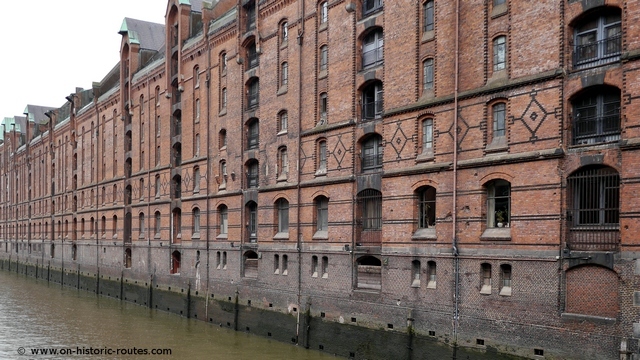 Hamburg’s historic Speicherstadt was not used for bulk freight. It was used mainly for coffee, tea and spices. The goods were taken from ocean going ships onto barge that can pass the low bridges in the warehouse district. They were then not only stored here but also processed, re-packaged and distributed. A really nice reminder of the traditional businesses in the Speicherstadt is a local, small coffee company (Speicherstadt Kaffee, website is German only) that roasts, sells and serves in the historic buildings. Something that fits perfectly into a sightseeing trip. For a closer look into the traditional warehouse business, you can visit the Speicherstadt Museum. A little off topic, but an attraction in itself is the world’s largest model railway – right next to the coffee company. Today’s global economy relies heavily on shipping. This however, is mostly containers and bulk. The historic Speicherstadt helps to understand, how a global supply chain was run about 100 years ago. In this way it perfectly complements the harbor tour of the modern port of Hamburg, the largest in Germany.